Tonight, four more teams will join Dalhousie in the CIS Final 8 men’s basketball championship. We preview the OUA match-ups, with winners of each game putting themselves in the national tournament. You could overlook this game because of it’s relative unimportance in the Final 8 landscape. I’d warn against that though, as the seeding implications make this particularly important. Ryerson, as hosts, have already qualified. The reigning-champion Ravens haven’t qualified yet, but even if they lose, they have another shot to qualify in the third-place game. You have to be wary of putting stock in that recent November game. Both teams have played a significant number of games since then and could have addressed issues from that game. That being said, how much is going to change for these veteran-laden rosters? Is 10 games really going to drastically alter either team’s play? Unlikely. But, there’s more time for scouting and game-planning. We know what Carleton’s offence is at this point: heavy reliance on Phil and Tommy Scrubb, with elite three-point shooters surrounding them. Part of what makes Carleton so great is that they’ve found ideal usage levels for all of their players. Phil and Tommy combine for using 53.4% of Carleton’s possessions, with Tommy taking 28.2% and Phil using 25.2%. Even at those rates (which have come down in 2015), they are extremely efficient players. Force one of those guys into shots or offload his possessions to other players and you might have a chance. I don’t know how you would do that, honestly, and if I did, I probably wouldn’t be here right now. This game is important for getting insight to how these teams play each other, what areas they look to attack and what weaknesses they still hold. Ryerson and Carleton haven’t played strong competition in a month. While this semifinal isn’t the best sell because it doesn’t have the real appeal of a Final 8 play-in game, there will be significant take-aways regardless of result. It has been five years since the Windsor Lancers last qualified for the national tournament. That feels like a pretty long drought for a team that has always came up in contender conversations. Last year was their best shot at returning but McMaster knocked them off in the OUA third-place game. This looked like it would be a gap year as players acclimatized to new roles. Now, they are one game away from a Final 8 bid. Their road isn’t without speed bumps. They have two significant losses, one to York and the other to Western. But Windsor has established their brand of basketball through this season and it is starkly different from that of the Ottawa Gee-Gee’s. 34% of Windsor’s field goal attempts are threes. Ottawa takes 45% of their field goal attempts from beyond the arc, while Carleton takes 39%. That balance makes sense for Windsor, as they only connect on 32.6% of threes, while the Gee-Gees shoot 41% and the Ravens shoot 46.1% (!!!!!). Windsor owns a 107.0 offensive rating, a solid mark that significantly lags behind that of Ottawa and Carleton, who would fall somewhere above 125+. Offence isn’t what Windsor has built their success off of though. Defence and rebounding have put them in this position. And their commitment to glasswork is a defining feature of the new-era Lancers. They rebound 35% of their misses on offence and 73% of defensive boards. Their opponent, the Gee-Gees, owns a 37% offensive rebounding percentage, but only a 71% mark on the defensive end. Now, I know these marks don’t jump off the page. I just said this was one of their strengths and then I put stats that compare equally to Ottawa. That’s kind of my point, though. Windsor’s rebounding marks are right there with the No. 1 seed. What a No. 1 seed this is though. Ottawa is really, really good and they’ve shored up the one area that people criticized them for: defence. I’m not going to write too much about the Gee-Gees because I wrote glowingly about them at the holiday break. Those numbers are dated, but the overall message stands. Defensively, Ottawa will have to keep Rotimi Osuntola Jr. off the glass and bait him into shooting on the perimeter. NJIT-transfer Mitch Farrell is a threat from outside, but his play has dropped off in recent weeks; he played 14 minutes against Toronto, scoring five points, but bounced up to 28 minutes against McMaster and dropped 10 points. He didn’t play against Laurier. 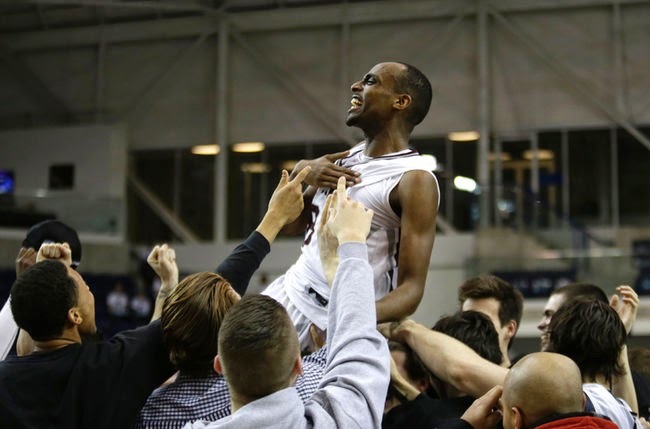 Farrell picked up four fouls in the two playoff games and McMaster attacked him. I wonder how worried the Gee-Gees are about this game, though. Windsor doesn’t guard the three particularly well (34.2% allowed) and that’s what Ottawa loves to do. Plus, the Lancers try to force turnovers and score easy buckets in transition, but Ottawa only turnovers it over 10 times a game. A quick aside: we should reevaluate the “live by the 3, die by the 3” cliche. If a team shoots 41% from three, it’s not fair to just assume they will have off-shooting nights. 40% is a ridiculous clip and a team should be commended for that accomplishment rather than scolded because of the perceived inconsistency of three-point shooting. At a certain mark, a team isn’t living by the 3, they are kicking the door down and winning championships. Anyways, the Windsor-Ottawa match-up is interesting. I’ll give the Lancers a bigger shot than most, but still think that Ottawa punches their ticket to nationals tonight. Don't forget about the CanWest championship either. If I knew enough to write about it, I would. CanWestHoops.com has a preview for you and those games look pretty tight on paper.